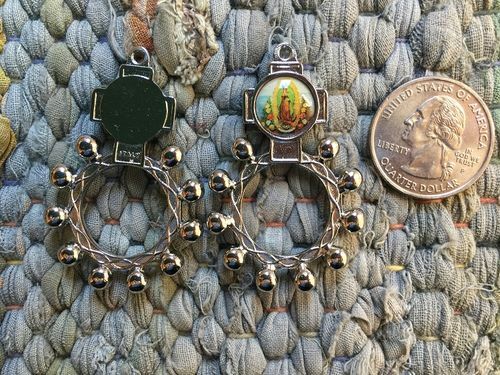 This silvertone metal Our Lady of Guadalupe finger rosary is made in Italy. The finger rosary is typically worn on the index finger of either hand, using the thumb to rotate the finger during the count. There are 10 beads and a cross with full color graphic image of Our Lady of Guadalupe on one side and St Diego on the other. This finger rosary has an integral hanging loop so it can also be strung on a necklace. Measures approximately 40mm or 1.6 inches.